Start your child on the path to reading success! At WCPL, we think reading is pretty important. As you might imagine, we’re not the only ones. Studies show that reading to young children is one of the best ways to prepare them to read on their own and get them ready to start school. As an added bonus, it can turn those little listeners into lifelong readers. 1,000 Books Before Kindergarten is a fun program that challenges you and your child to make an official commitment to reading. Though reading 1,000 books may seem daunting at first, once you break it down to books per day, it becomes more manageable. In fact, you could surpass the goal in three years by reading just one book each day, or you could finish in less than one year by reading three books each day! This program allows you to read at your own pace to reach your goal. Every time you read a book, color in or cross out a number in the journal. After each 100 books read, visit the Library to receive a puzzle piece to complete the puzzle at the end of your journal. 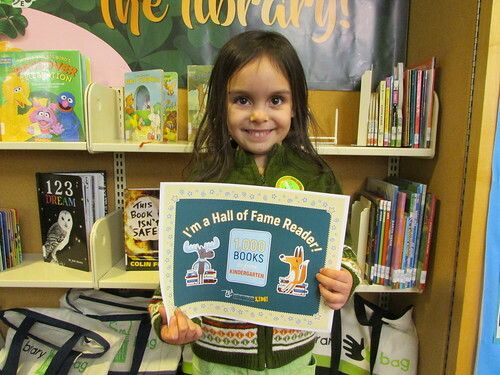 Once you’ve read 1,000 books, you’ll earn the final puzzle piece, a certificate of achievement, and your child’s photo in our 1,000 Books Before Kindergarten Hall of Fame. *If you’d prefer to go paperless, you can track your reading using the official 1,000 Books Before Kindergarten app. Just start on your own, and visit the library after you’ve read your first 100 books. ABC Letter Writing App - Help your child learn to write the alphabet using recommended stroke order and placement. The FREE app uses letter grid lines endorsed by top educators and penmanship experts to help your child visualize how the letters should line up. Both upper and lowercase letters are included. Q: Do we have to read only library books? A: No! We encourage you to read any books you’d like! Feel free to count any books you read towards your goal, even eBooks or books that your kids listen to online, like TumbleBooks. Q: My child has certain books that she likes to read over and over. Can I count the same book more than once? A: Yes! It’s normal for kids to have favorite books, and actually, that repetition is really good for their brain development. You can count each book every time you read it! Q: My child is starting kindergarten in just six months. Is it too late for him to start this program? A: No! Any child who has not yet started kindergarten is eligible for the program. You could finish the program in six months by just reading five or six books each day. Your child will still reap the benefits of the extra time you spend reading. Q: We prefer using the app rather than tracking our reading using a journal. Can we still do the puzzle activity? A: Yes! When you come in to get your first puzzle piece after reading 100 books, just let us know that you are using the app and don’t have an empty puzzle page. We’ll give you a puzzle sheet, along with your first puzzle piece. You don’t need to get an entire journal just to do the puzzle. Q: I have more than one child who has not started kindergarten yet. Can all of my kids participate? A: Yes! We encourage ALL kids who have not yet begun kindergarten to participate in this program. You can get a journal for each child and track books separately. If you’re using the app, it allows you to track multiple children. Of course, if you’re reading books all together, those books will count for each child who listens. Congratulations to these children and parents for completing this program! Have a question about this program? Ask a Youth Librarian. All Library properties are tobacco-free environments.